You are currently browsing the tag archive for the ‘review copies’ tag. I’m always up for books about expat life. For the sake of a good yarn many either romanticize or vilify the experience (there’s more to Paris than drinking a glass of red wine in post-coital glow in a mignon little loft overlooking the Eiffel Tower. And, surprising as it may seem, it’s possible hire people to fix the roof of the ruin cottage you just bought in Portugal without being coned), but others manage to perfectly capture the “unhingeness” feeling of living in a foreign country. I’m happy to report that The Tapestry of Love is the second expat-life book I’ve read this year that was truly satisfying (the first being Extra Virgin: Amongst the Olive Groves of Liguria by Annie Hawes). 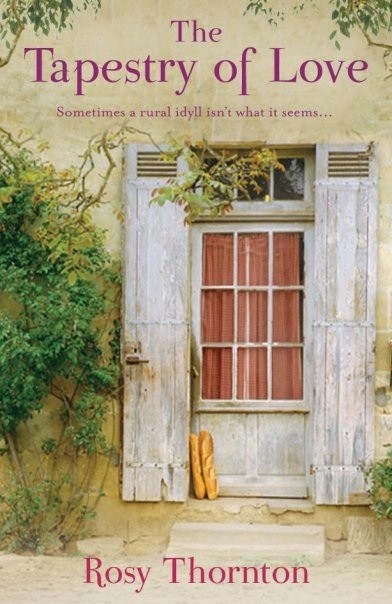 It matched my experiences in France and with the French, as well as my childhood’s summer months spent in an isolated mountain village. Not a lot happens in The Tapestry of Love, but there’s pleasure for the patient reader willing to follow Catherine as she adapts to her new way of life. She sets up a stall at the local market, she leans to make honey, she’s asked by the local priest to restore a centuries-old tapestry. She also meets a tall, dark neighbor, the mysterious Patrick Castagnol. Some of my favorite parts were descriptions of the meals he cooks for Catherine. I couldn’t get my head around why Patrick slept with Bryony. I mean, by the time she visited he was already falling in love with Catherine, and making some progress in his courting. Saying he was weak and just did what Bryony wanted sounded contrived. Also, why exactly did Bryony leave him? Because he wasn’t a true country man and (gasp!) used to work in the City? Some of the plot around Patrick wasn’t very smooth. I empathized easily with Catharine, the way she adapted to slow-living, her taste for solitude and, most of all, the way she embraced Cévennesto a point where it became more “home” than England. Her guilt about leaving her family, in particular her aging mother, also rang true. Whenever people ask me why I sacrifice that for the sake of being abroad, it’s hard to explain my addiction to the feeling that my senses and perception of what surrounds me are somehow heightened by default. It was good to see that same feeling in The Tapestry of Love, through Catherine’s descriptions of the Mountains, its people, costumes and food. This book made me once again fantasize about quitting city life and give the country a chance. I often think about certain places that had the same effect, in particular the Scottish island of Mull, but then reality hits and I have to agree with Woody Allen when he says “I am two with Nature”. Many thanks to Rosy Thornton for the review copy!